I love the Little Britain comedy show and the humor the main comedians, David Walliams and Matt Lucas, bring us in their other sketch comedy endeavors. You don't see very many celebrities joining the swimming crowd and therefore, I was quite excited when I saw that David Walliams is putting on a charity event to swim 140 miles (225 km) in 8 days through the river Thames in England. I mean, can you imagine swimming that far in 8 days? He is definitely not a lady :). Not even Olympic athletes like Michael Phelps do such insane amounts of swimming in such a short period of time. Sure, there are the occasional training camps with massive amounts of swimming and, also, let's not forget the open water swimmers who do their share of long distances in free flowing waters. However, they probably very rarely average 28 km (18 miles) per day over 8 consecutive days and in such a dirty water conditions such as the Thames. Open water swimming was added to the 2008 Olympics in Beijing as an official event for the first time in the history of the games and it has become much more popular amongst the general public since then. It could be that David is riding the open water popularity wave as well; however, swimming 140 mi(225km) in 8 days for a non-competitive lap swimmer is a sports feat to be applauded. Very impressive, David Walliams, and keep up the good work in the water and out. I take my hat off to you. That said, I am not sure that swimming so far in 8 days is a very smart thing to do if you have a bad swimming technique. This is not a Little Britain sketch and it could definitely lead to injuries, which I am sure David would like to minimize if he wants to keep swimming to raise more money for charity in years to come. The Walliams vs. Thames marathon swim raised over 1 million British pounds which is a whopping figure and I am sure it will do a lot of good somewhere in the world. Again, very well done David. After watching a few of the videos on David Walliams' Walliams vs. Thames charity site, I decided to give David some swimming technique advice, since it appears his personal trainer, Prof Greg Whyte, more than likely lacks the needed knowledge to improve David's technique from his 2008 English Channel crossing to this year's Thames challenge. I do not know Mr. Whyte personally, so cannot judge his expertise as a personal trainer, however, as a trainer for swimming he still has a lot of room for improvement. Obviously, Mr. Whyte must have done a great job preparing David's stamina to withstand such a long energy draining swimming event. However, if I was David's swimming coach, I'd be ashamed to see him swim with such a lack of correct technique and it would make me quite reckless to support his decision to do the 140 mile swim with his current swimming stroke. (Sorry, I am not going to use Mr. Whyte's plethora of professor titles as I find it ridiculous when people still use these. I find that people who hold titles such as PhD or Prof, or whatever, utilize the titles to hide some of their inadequacies assuming people are in awe of a name with 3 titles. Call me crazy, but that is the way I feel). 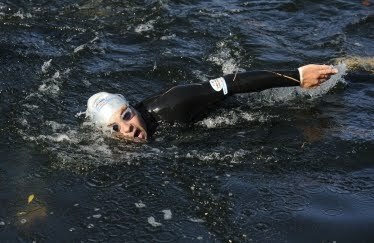 Anyhow, enough of my rambling :), back to the marathon swim and my swimming technique analysis. The footage of David swimming is not the greatest, but it is enough to give us a high level picture of his stroke and how he is doing. The first mistake that hits me in the face is the position of David's body in the water. David, you need to swim more on the sides of your body and not just on your stomach. Think of it as slicing the water with your left and then your right side and using your flat stomach position only as a transition between the side switch. What you will achieve with modification of your stroke is less drag while swimming and also a longer stretch with your arm, so you can pull more water. A great way to enhance your side balance and hip rotation would be to perform a series of side kicking drills where you are on your side with your eyes looking to the bottom of the pool and arms at your side or bottom arm extended forward. You should incorporate these swimming drills into every workout and you will see what a big difference this makes. My next issue with David's stroke comprises two parts. One is the fact that David crosses the middle of his body with his hands when entering them into the water in front of his head (cross-over). The other mistake is that David's hand enters the water with thumb first. So, David, entering thumb first into the water causes inner rotation in your shoulder which could cause serious shoulder problems. Your fingers should go in first with your palm flat, without extra twisting. With regard to this cross-over problem, perhaps the following technique tips will help you out. David, with his height and build, has a great swimming advantage as he can utilize his long arms to catch more water. But with 2 miles (3.2km) / hr average speed, it is apparent he is not as effective a swimmer as he could be. David, you should work on utilizing your forearm to pull yourself forward through the water, instead of dropping your elbow early in your catch. The early vertical forearm technique would work very well for you since you are so tall. You can start improving by doing a lot of one arm freestyle drills and also catch up swimming. Also, there is a great tool called the Antipaddle which can help you get more out of your pull. Finally, David's head position and breathing are way too far out of the water. However, this is a bit tough to assess from the footage as David spends half the time waving at his supporters cheering him on from the river bank. Also, since the river is so dirty, it is probably not a good idea to utilize the one goggle in, one goggle out rule to prevent accidental breath of the water. So, I'll let this one slide David :), but just in case you find yourself in cleaner waters, getting your head deeper in the water and breathing to the sides instead of the diagonal front will give you a better body position and let you take advantage of the water's buoyant properties instead of trying to stay on top of the water. It should feel like you are pressing the top of your head into the water as if you are swimming downhill. These were just some quick tips for you, David Walliams. I hope you take them to heart and work on your swimming technique so your next gruelling challenge is a feast for swimmers to watch. If this is too much negative feedback at once, please believe that I am a huge fan of yours and Matt Lucas' comedy and that your sports challenges are inspiring for us all. Great job, however, be smart about your swimming and keep it up! If you like the charity swim David Walliams performed in Thames and you are wondering how you as a swimmer could contribute to our ever growing society and the environment in which we live, why not checkout the Blue Mile 2011 initiative. Blue Mile's aim is to raise funds and awareness for the protection of our rivers and oceans, by getting resourceful swimmers to organise their own swimming events. The Blue Mile staff will guide you through the process and help you with event organization as much as they can. You can be very creative with your event - swim in fancy dress, swim in shoes, design your own swim suit etc. So go out there and help the world to be a better place! Update: As I predicted, David Walliams has suffered some serious damage to his back or at least the media say it was serious:). So, this is actually a good learning experience for us all. Let's be smart about sports and select your coaches wisely. @anonymous: thanks for sharing the article. I hope David will be ok after some physio. I didn't like the comment in the article that he will never do any other charity swim. It is understandable, he feels very bad now and is probably quite disappointed in his health state, however, with some hard work in the pool on his swimming technique, there is no reason he couldn't jump back in for some swimming awesomeness and charity awareness. So hopefully, David takes it to heart, gets healthy and continues improving his swimming skills. It would be shame to loose such a great swimming celebrity.